Hey, it’s time for naked promotion time, and a small part of why I haven’t been posting so much lately: you can now check out and buy the iPhone app that’s been in development for the last few months, built by my dad and I (mostly my dad, who has a couple of other fine language apps in the store). It’s called 2nd Guesser, and it’s a couple bucks. You’ve probably seen me rant about this kind of in-game stuff here on USSM over and over, citing Tango’s Inside the Book, massive studies on when it makes sense to bunt, or how crazy it is to intentionally walk batters in most situations where it’s considered normal. I really think using run expectations and WPA are key to understanding effective in-game strategies, and I hope that in offering a really easy way to experiment with tactics, especially as you follow a game, it’ll make all of this more relevant and understandable. 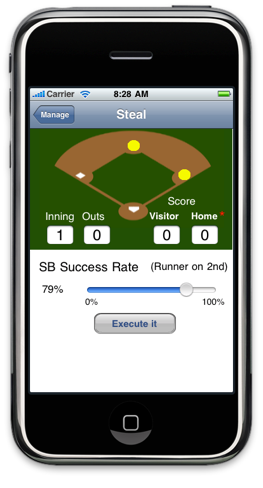 I know, it’s a niche app, designed to serve you, watching a game and wondering whether it’s worth bunting a guy over if you’re the home team tied in the ninth. But I think it’s pretty cool, and it’s got a lot of potential to grow. Over the off-season we’re planning on making further improvements (for free! 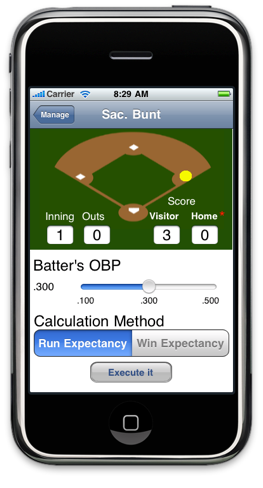 ), including working on the UI based on early feedback, building out the managerial interface, and as the M’s like to say, much, much more. So if you have thoughts, drop me a line, unless you’re going to talk about the price point. Anyway, many more photos follow after the break here. Check it out. Does this app get live information about the game situation or do you have to enter it in yourself? I’m suspecting it’s the former, but I’m not sure. You have to update it yourself. But it’s quite easy to do so. Can we get one of these into Dave Trembley’s hands??? Well it’s easy to put in that the M’s are up 2-1 with no outs in the 8th with a runner on first, harder to know what Ichiro!’s SB% is off the top of your head. This is great. 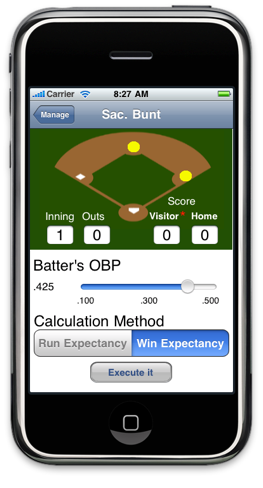 To make it amazing, put your heads together with the fine folks over at FanGraphs and their iPhone app — which does have real-time game state information and player statistics. On the other hand, maybe it wouldn’t be fast enough — the feeds always lag the actual game by a minute or so (damn humans in the loop). Still, you could at least pull the actual lineups and statistics from over there, which would help. Well itâ€™s easy to put in that the Mâ€™s are up 2-1 with no outs in the 8th with a runner on first, harder to know what Ichiro!â€™s SB% is off the top of your head. Do you have plans to make a version for the Android? This is too damn cool. If only I owned an iPhone. Any plans to make this available on Android? I was expecting a higher level of snark in the results, especially the error dialogs on particularly ridiculous strategies. 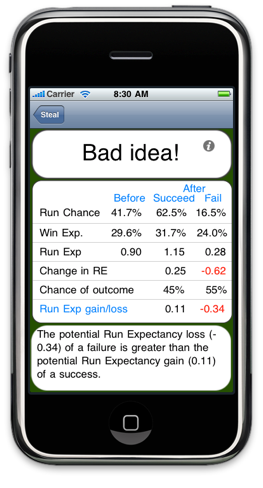 Also, second the request for links to lineups, though I do know how much more complex that will make the software. Hey, I don’t have to write it. Though I’d be happy to help you test it. How about a BlackBerry version? Is this currently available? I’ve gone to the Apps store and I’m unable to find it. Cool idea. 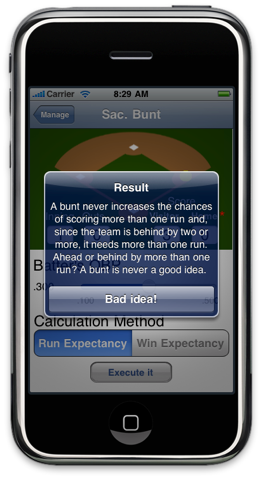 But one of the things that makes these calculations difficult in real world situations is not just the game state (outs, baserunners, score, and inning) but lineup effects as well. Not just the stats of the batter (if it’s the pitcher, bunting is much more likely to be a good idea), but the stats of the on-deck batter, and the next batter after him, and etc. 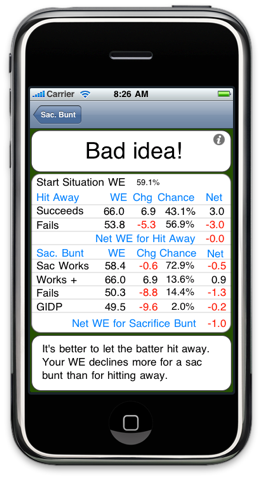 Plus there are strategic issues: if you steal 2nd, maybe the opposing manager promptly decides to give an IBB to your next hitter so that his righty pitcher can face your righty hitter, but you’ve got Ken Griffey ready to PH for just that situation, but the opposing manager has his LOOGY, but you’ve got … etc. etc. etc. Those are difficult to model, even with Monte Carlo simulation of thousands or millions of situations. I can’t tell for sure, but it doesn’t look like the app is taking into account many of those complexities. Most discussions of say the value of a stolen base or a bunt or an IBB use standard game-state and win probability matrices, which are based on average situations, and are not designed for specific lineup situations, quality of the pitcher and batter, lefty-righty situations, etc. One of the great strengths of Tango’s work is that he did take a lot of those complexities into account in The Book. 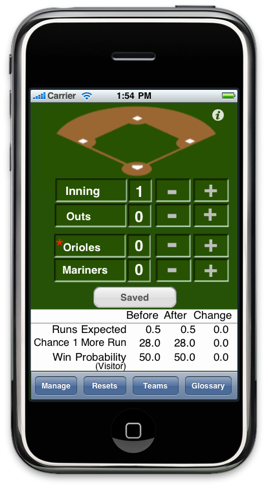 2nd Guesser’s future — by the time spring training rolls around next year, we’ll have an update that will include line-ups with almost-real-time data (the data will be updated every night). I am in the processing of thinking through the port to java, which would then allow it to run on an Android and Blackberry. That probably will happen, and I hope before the start of next season. As for MKT’s comments about the complexity of situations…that will likely never happen, simply because the calculations would bring any hand-held device to its knees. 2ndGuesser’s goal was to give a fan something to understand better what’s happening in a game, not to give the manager a tool to use in the dug-out. Looking forward to seeing this show up on Android. I love the name 2nd guesser. I hope, no one else has a trademark for it, yet. You should try and obtain the trademark, IMHO. Will there be a version for the personal computer as well? Or, as an idea, maybe this is something you can sell to fangraphs, hardball times or baseball prospectus. Anyway, good luck with this project. I’d sure buy it if I had an i-phone.